The Village Store on Main Street has been the veritable heartbeat of Bridgewater for generations. For over a century, the large clapboard structure with its 50 foot tower, situated amid shady elms, has served as a community hub and gathering place to this rural hamlet. The building proudly stands today looking much like it did 100 years ago when it was the site of the first mail order business in the U.S.
Charles Thompson, the country’s original mail order man, was born in town in 1852. Thompson began his hugely successful mail order business in 1866 with wares like charms, cheap jewelry, toys and trinkets. While others soon followed his lead (including Sears in 1886), his business continued to thrive, in part because he had discovered that through advertising he could sell goods across the country. For a time he was the largest advertising space buyer in the entire country, and because of the large volume of his business the town became a mecca for salesmen from all corners of the world. Following his success with the first “talking doll”, he began to manufacture cosmetics and toiletries. His most eager and diligent customers were a veritable army of little girls who wanted to win the free dolls he offered to those selling the most soap. So overwhelming was his mail order soap business that he was forced to open a factory of his own, which today houses the Village Store. In those days the U.S. mail was carried in two-horse farm wagons, and it was reported that one day more mail was shipped out of tiny Bridgewater than out of New York City, thanks to Thompson’s mail order success. He owned the very first automobile in Bridgewater, a Stanley steamer open touring car. It is also said that Mr. Thompson brought in an Edison talking machine, which he set it up in his factory to entertain the town. In 1927, Peter Ognan of Roxbury purchased the Thompson building from Charles Thompson and, after the necessary equipment was installed, he opened a very small emporium at the same time that Sunday “motoring” was becoming popular. 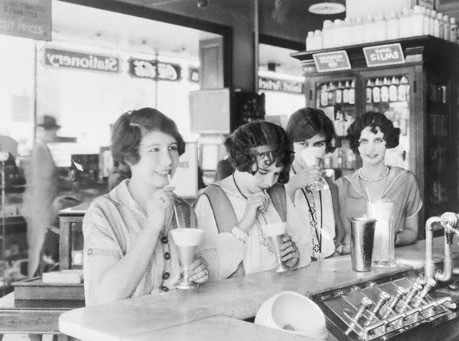 Pete’s store had a long soda fountain along the south wall where one could buy ice cream, sodas, sundries and 5-cent ice cream cones. He also sold tobacco, cigarettes, and bread, as well as providing a gas pump. Unheard of at the time, Pete’s was open on Sunday to cater to the motoring public and he partitioned the upstairs in to rooms, making an “over the store” apartment for himself and his new bride, Mary Higgins. It was also at this time that the building was outfitted with plumbing and electricity. Local merchants Levi Warner and Bruce Randall purchased the property from Mary Ognan in 1937, at which time they moved their business from the Center Store across the Road. 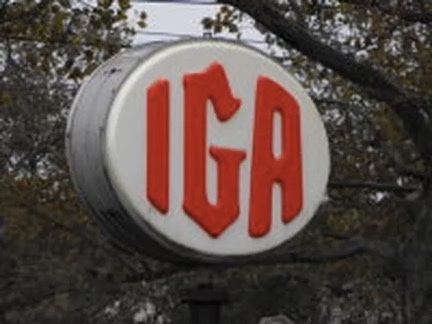 In this new location the partners ran the Bridgewater IGA store, a business that lasted 17 years. In 1954, the building was sold to Donald and Eleanor Gowan. With the young Gowan couple at the helm, the building officially became known as the Village Store, a “modern” place of business that still retained its country store atmosphere. By 1964 the town had grown to a point where more space was needed for the Post Office that remained in the building, and the Litchfield County National Bank wanted to locate a branch in the center of town. The Gowans were given permission to build an addition on each side of the original building to house the new Post Office and bank. After Mr. Gowan passed away in 1972, the store stayed in Mrs.Gowan’s hands until her retirement in 1983, thanks to her dedication, commitment to the community, and the help of family members and loyal employees. Locals who recall these years say she was the “heartbeat” of the town, and would think nothing of opening up the store after hours if a baby needed milk. She also manned the fire phone, and would sound the siren to summon firefighters if needed. 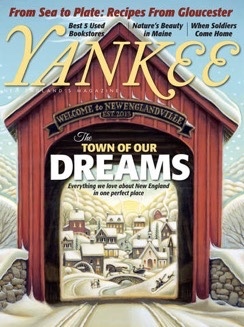 After 29 years of Gowan ownership, the historic property was sold to Harold and Nancy Noble of Massachusetts in 1983, after they replied to an advertisement for the Village Store that appeared in Yankee Magazine. Three years later they sold the store to Patricia and Garret Cooper. A brand new, modern convenience store and gas station was being built just a short distance away, and many locals worried that this signaled the end for the beloved town landmark. For three years the Coopers ran the small business, but the store’s old time charm had been eroded and patrons were falling off. In 1989 the Coopers sold the Village Store to Leni and Peter May of Bridgewater, who had been frequent visitors to the area for over 30 years. In response to an outpouring of pleas from the community that the general store’s old time character be returned, the Mays diligently began the task of restoring its tradition. “My objective was very simple,” Mr. May related, “I wanted to bring it back to the days of Eleanor Gowan, when it was the community center.” While he has added new offerings and gourmet coffees, the cosmetic improvements they have made have all been to preserve its original character and Victorian architecture. that married the high quality chocolates he’d grown up eating in his native Sweden with the American style of confections. Bridgewater Chocolate brought the mail order business back to the building for a time, before it moved out of the store in 1999 (although their line of handmade chocolates continues to be sold onsite today). In 2013 following the closing of the bank branch that was housed in the store, the Mays knew something needed to be done. The store had continued to loose money year after year despite the love and attention that they put in to it, and so they asked their neighbors to share with them feedback as to how to best serve the community. The responses they received made it clear that the town wanted them to add table service as part of a restaurant operation that would also serve wine and beer. 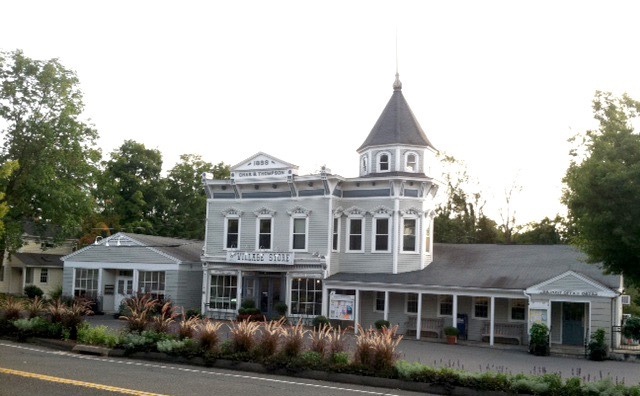 After succeeding in passing a referendum to eliminate Bridgewater’s dry status, they moved forward on a plan to expand and upgrade the beautiful Victorian landmark, making sure to enhance the integrity of the original design. The store reopened in the summer of 2016 and Bridgewater Bistro was added in the fall of that year, serving locals and visitors alike throughout the day, as well as dinner five nights a week. The renovation of the store and addition of a restaurant has allowed the Bridgewater Village Store to continue to serve as a hub for the local community, and a testament to the town’s rich history and small town charm.